The Photoshop Elements workspace in Edit mode shows you some of the power that Elements offers with just a click of your mouse button. When it comes to editing a photograph, you find quite a collection of tools, panels, buttons, and options in the Photoshop Elements Edit mode. From the Photoshop Elements 9 Welcome screen, click the Edit button. The standard Open dialog box appears. It works like any ordinary Open dialog box you find in other applications. Open the folder containing the picture and then select a picture. If you haven’t yet downloaded digital camera images or acquired scanned photos and want an image to experiment with, you can use an image found in your Pictures folder. The photo opens in a new image window in Elements. You can open as many image windows in Elements as your computer memory can handle. When each new file is opened, a thumbnail image is added to the Project Bin at the bottom of the screen. 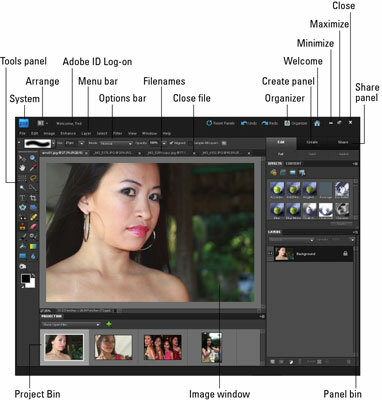 The Photoshop Elements 9 workspace in Edit Full mode. Filename: Appears above the image window for each file open in the Editor. Scroll bars: Become active when you zoom in on an image. You can click the scroll arrows, move the scroll bar, or grab the Hand tool in the Tools panel and drag within the window to move the image. 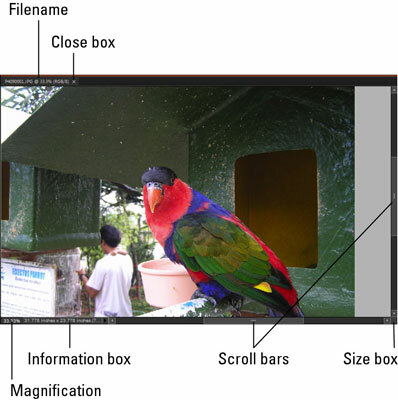 Magnification box: Shows you at a glance how much you’ve zoomed in or out. Information box: Shows you a readout for a particular tidbit of information. You can choose what information you want to see in this area by selecting one of the options from the pop-up menu. Size box: Enables you to resize the window. If you move the cursor to the box, a diagonal line with two opposing arrows appears. When the cursor changes, drag in or out to size the window smaller or larger, respectively. You can also resize the window by dragging any corner in or out (Windows). The image window displays an open file within the Elements workspace. The Information box’s pop-up menu enables you to choose the type of information you want to view in the Information box. Click the right-pointing arrow to open the menu. Document Sizes: Shows you the saved file size. Document Profile: Shows you the color profile used with the file. Understanding color profiles is important when printing files. 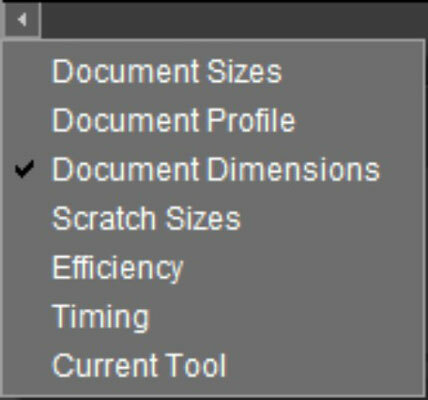 Document Dimensions: When selected, this option shows you the physical size in your default unit of measure, such as inches. Scratch Sizes: Displays the amount of memory on your hard drive that’s consumed by all documents open in Elements. For example, 20M/200M indicates that the open documents consume 20 megabytes and that a total of 200 megabytes are available for Elements to edit your images. When you add more content to a file, such as new layers, the first figure grows while the second figure remains static. Efficiency: Indicates how many operations you’re performing in RAM, as opposed to using your scratch disk (space on your hard drive). When the number is 100%, you’re working in RAM. When the number drops below 100%, you’re using the scratch disk. If you continually work below 100%, it’s a good indication that you need to buy more RAM to increase your efficiency. Timing: Indicates the time it took to complete the last operation. Current Tool: Shows the name of the tool selected from the Tools panel. From the pop-up menu on the status bar, choose commands that provide information about your file. Why is the information displayed in the Information box important? Suppose you have a great photo you want to add to your Facebook account and you examine the photo to find the physical size of 8 x 10 inches at 72 pixels per inch (ppi). You also find the saved file size over 5 MB. At a quick glance, you know you want to resize the photo to perhaps a 4 x 6 inch size and 72 ppi. Changing the resolution dramatically reduces the file size.